Although this 19th century artist may not be well known in Oakville, his contributions to the Oakville arts scene should not be overlooked. 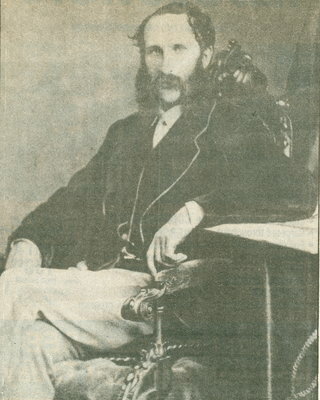 Born in the area of Oakville which is home to Sheridan College today, many of Verner's paintings were on display at the Customs House Museum at Erchless. His painting called "The Mill on the Sixteen" is perhaps one of his more famous, depicting the landscape of Oakville in its early days, when the harbour, grist mill and saw mill were just being established. Susan Menzies is best known for her detailed wildlife paintings, and her success has allowed her to surpass the notion of a struggling artist. 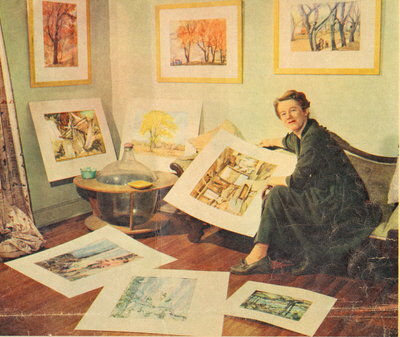 With numerous exhibits in her native Oakville over the years and her own publishing company, Menzies has helped establish the town of Oakville's reputation as a haven of fine art. Her ability to capture nature in all its majesty has encapsulated the minds of many who adore her work. An advocate for wildlife conservation, Menzies' contribution to the arts, and to Oakville, are recognized and valued. This free-spirited artist likes to paint according to his moods and tastes. He paints for himself, and what he sees and feels in a given moment. If he can produce a work that others enjoy as well, all the better. 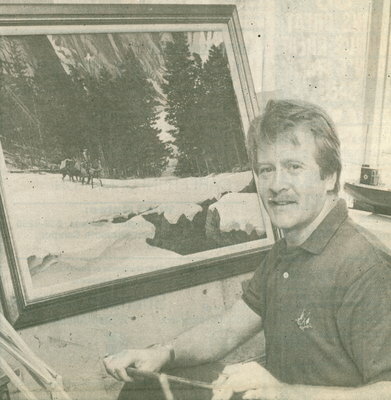 As a commercial advertising artist, Laird enjoys the times when he paints not because he has to, but because he wants to, and the mood strikes him. His exhibits in Oakville showcase the work he manages to produce in his spare time, the products of his creativity and emotional experiences. A valuable addition to the arts community of Oakville, Laird is a talented artist who will be remembered for his artistic style and originality. 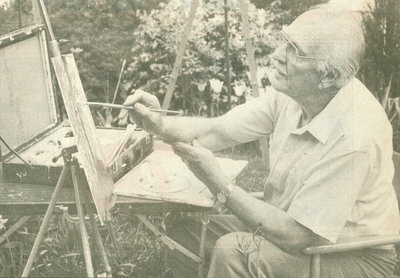 Looking back on the life of Oakville artist Gwynyth Young tells a story of dedication to the arts community. Young experimented with different mediums and attempted many types of artistic endeavors over the years, including the design of masks and stage props for the Royal Winnipeg Ballet as well as some work with silkscreen prints. 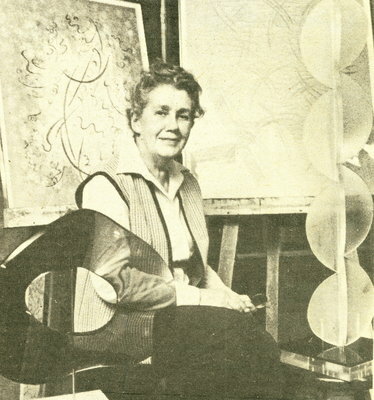 She had a hand in designing Halton's crest, and she played a role in the design of Centennial Galleries and Plaza. 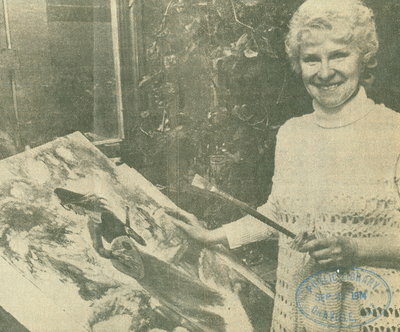 For her contributions to Oakville's arts scene, she became an Honorary Life Member of the Oakville Art Society, and had a show room named after her at the art gallery at Gairloch Gardens. Elizabeth Hoey of Bronte, was a designer and printer of fabric patterns. She is also known for her watercolor paintings of Canadian motifs. 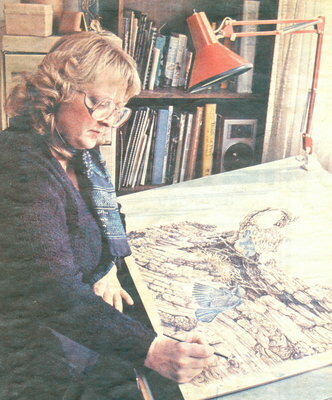 Her work has appeared on several greeting cards, and she has been commissioned to complete projects for companies abroad. Oakville artist George McElroy explores Oakville's history with his paintbrush. 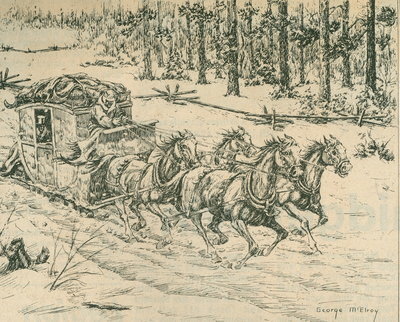 Many of his exhibits displayed throughout Oakville over the years depict various landscapes and landmarks which have significance to the town of Oakville and its rich history. 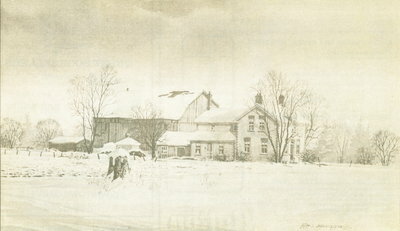 Notable paintings include that of the Oakville House and the granary as it appeared in 1969. Known for accurately and consistently documenting life in his hometown, Oakville artist Michael Hitchcox has had countless art shows and exhibits in multiple Oakville galleries over the years. 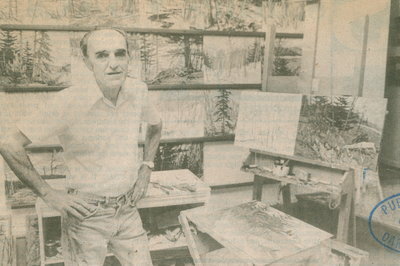 Oakville has watched his artistic style grow, always serving as an eager market for his paintings. 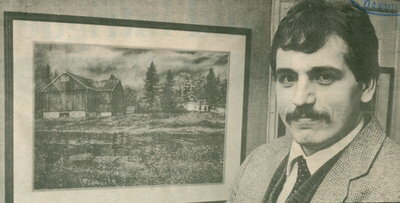 Hitchcox is known for his focus on preserving the memories of the town's landscapes and historic sites for future generations. Accomplished artist, photographer, and filmmaker, Oakville's Gerry Quinney has certainly made his contribution to the local arts scene. In fact, an encounter with Oakville artist Thomas Chatfield rekindled his lost love for painting after taking a break to work on his career as a documentary filmmaker. 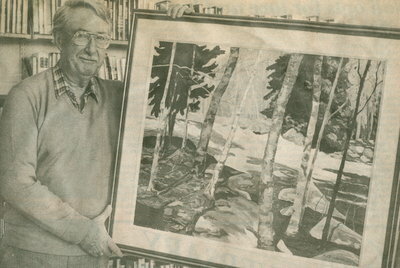 Gerry Quinney was a member of the Oakville Art Society. Landscape artist Charles Snelson is known for his paintings which create a scene or mood, and not just an image. An Oakville native, Snelson is inspired by the beauty of Oakville's wildlife and natural resources. He studied with Group of Seven artist Arthur Lismer in his younger days, and this training has inspired him to always seek the perfect composition and atmosphere to capture in paint. Snelson loves color, so fall is one of his favorite seasons to paint. 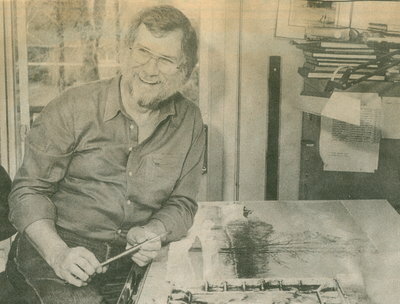 Like fellow Oakville artist Gerry Quinney, Snelson studied briefly with Oakville artist Thomas Chatfield, and is also a member of the Oakville Art Society. Just from looking at some of the artists on this page, one might think that the project of preserving heritage landmarks is one commonly undertaken. This may be true, but the ongoing dedication of artists like Oakville's Alan Kingsland has proven to be more important with the passage of time. Kingsland realized that the physical evidence of the town's history would not be around forever, so his sketches of landmarks like the granary and the old railway station attempt to recreate these scenes so that they are not entirely lost as Oakville grows and develops. Illustrations, graphics and painting with various mediums are all in the repertoire of longtime Oakville resident and artist, Audrey Matheson. Her diverse style allows her to take on many different projects, whether they be commissions, portraits of people and pets, book illustrations, landscapes or even designing posters. Tom Chatfield's love for the land in all its seasons shines through in his artwork. He is known for his colorful landscapes which evoke emotion with their abstract flare and creative styling. Canada's rugged terrain inspires Chatfield's work, especially the sights of Algonquin Park which are featured in many of this Oakville native's stunning paintings. As a member of the Society of Canadian Artists, Chatfield represents Oakville well, and the town has had the great pleasure of hosting some of his exhibits in its renowned galleries. 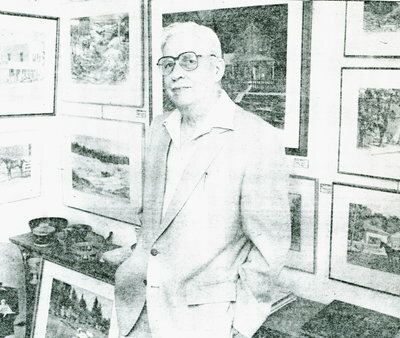 Chatfield was also a strong supporter of the Gairloch Gardens Gallery, contributing various works to their permanent collection. 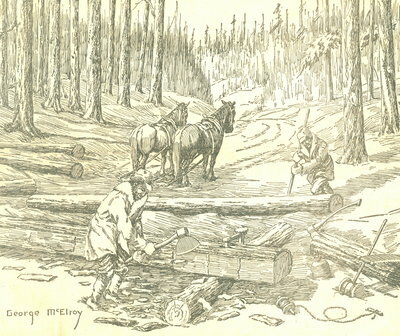 Artist biographies are credited to various publications of The Oakville Beaver and its pedecessors.